~ Vibrant voices in the arts community. Welcome back! 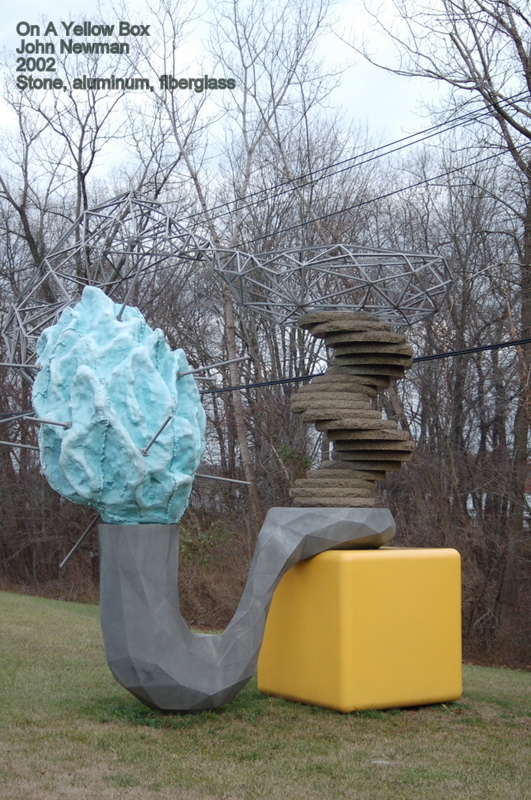 When we last chatted, we looked at The Sculpture Foundation’s Sculpture On The Way installations on I-295 and Sloan Avenue in Hamilton, NJ. 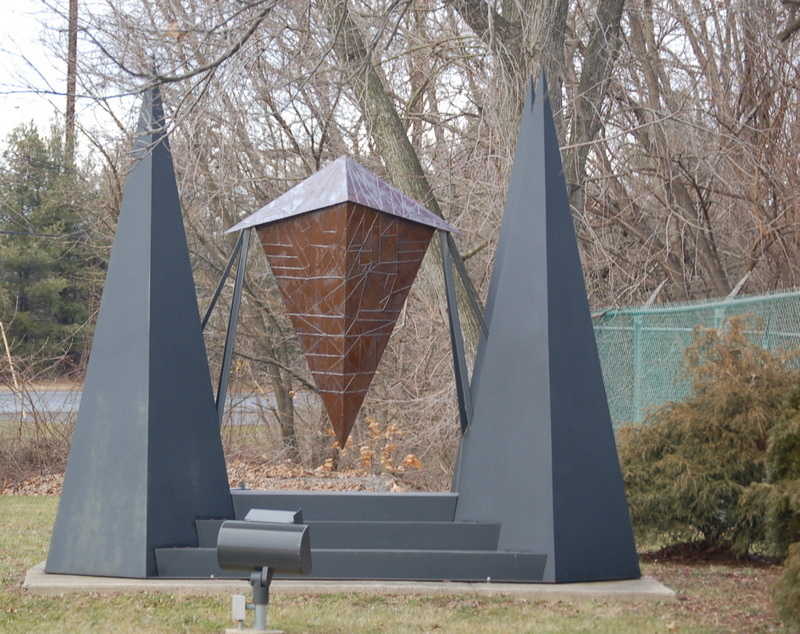 Today, we’ll begin our tour at the intersection of Sloan Avenue and Klockner Road. First up is God Bless America, a 25 foot tall aluminum sculpture by Seward Johnson. God Bless America is based on the famous Grant Wood painting American Gothic, done in 1939. Many who see this sculpture attribute the original painting to Normal Rockwell. 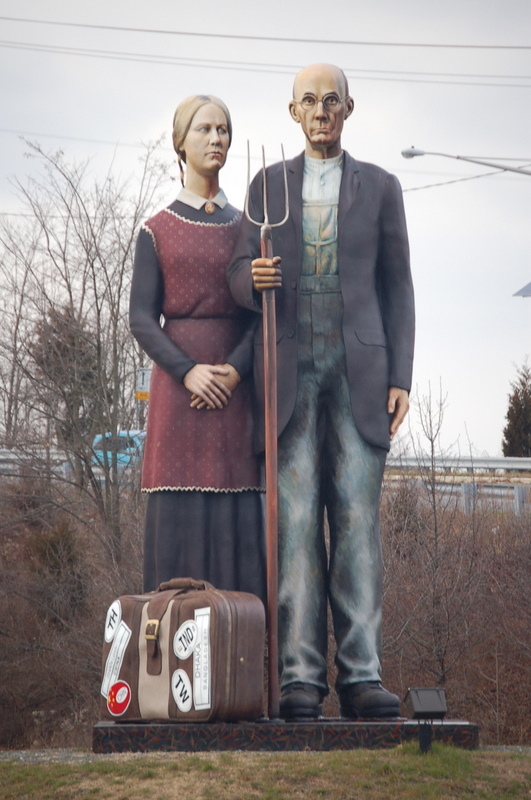 Most see both the original painting and this sculpture as a farmer and his wife. However, Mr. Wood’s sister is the model for the woman, and the couple is actually a farmer and his daughter. Hmmmm. Mr. Johnson has taken the liberty of adding a suitcase with destination stickers prominently displayed. Some folks look at this as indicative of the USA being a nation of immigrants, while others say it shows the penchant for travel among Americans. The view from the back seems to reinforce this latter view given the cars in front. Look for a complete depiction of this painting, complete with the barn background, at Grounds For Sculpture in the near future. Across from God Bless America is It’s So Tall, also by Seward Johnson, a young couple gazing at the huge sculpture across the street. 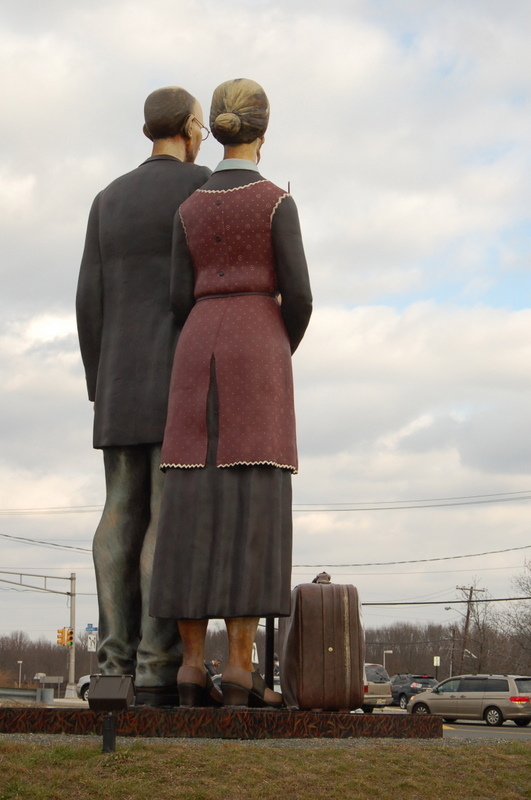 This couple has stood in this same spot gazing up at various Seward Johnson monumental sculptures that have stood in the same place as God Bless America, among them Unconditional Surrender, based on the famous photo of the sailor kissing a nurse, and Los Mariachis, who have seemingly walked their serenade across Sloan Avenue. Next we come to Fletcher Benton’s Wheels I. 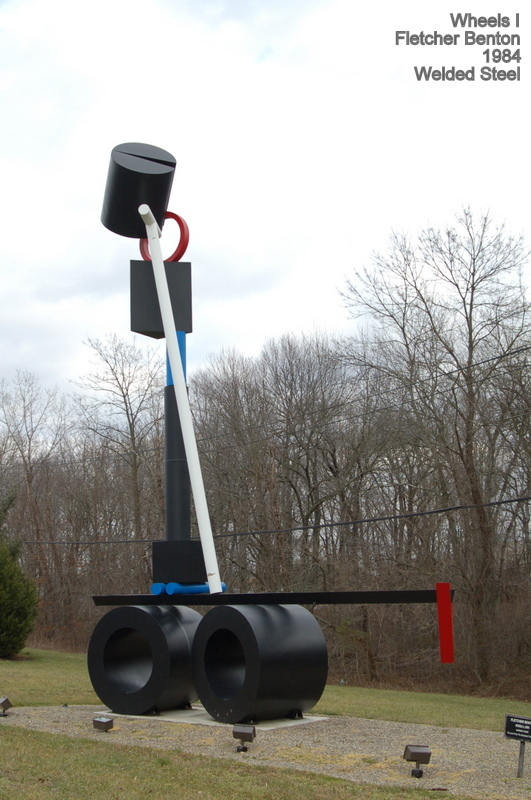 This sculpture of painted and welded steel seems to defy gravity with its large mass on the one side counterbalanced by a small red piece on the other. 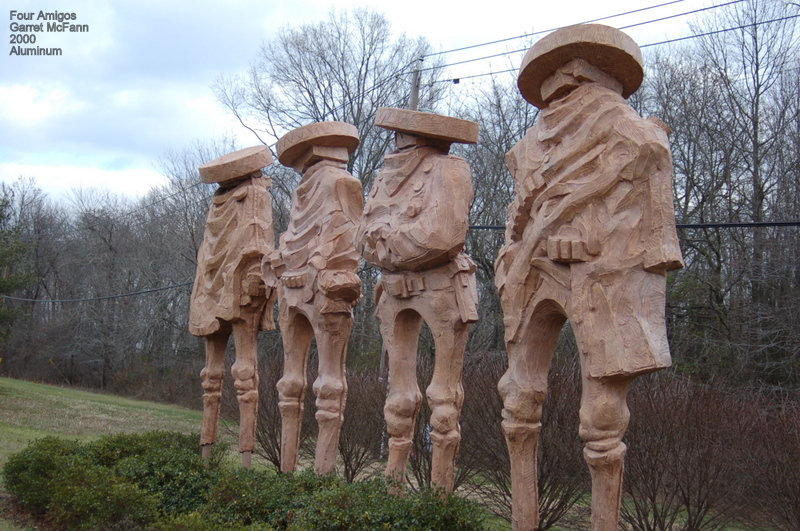 The next piece is Garret McFann’s The Four Amigos. This cast aluminum sculpture seems to be made from cut stone. Across from this is Andrzej Pitynski’s The Partisans. 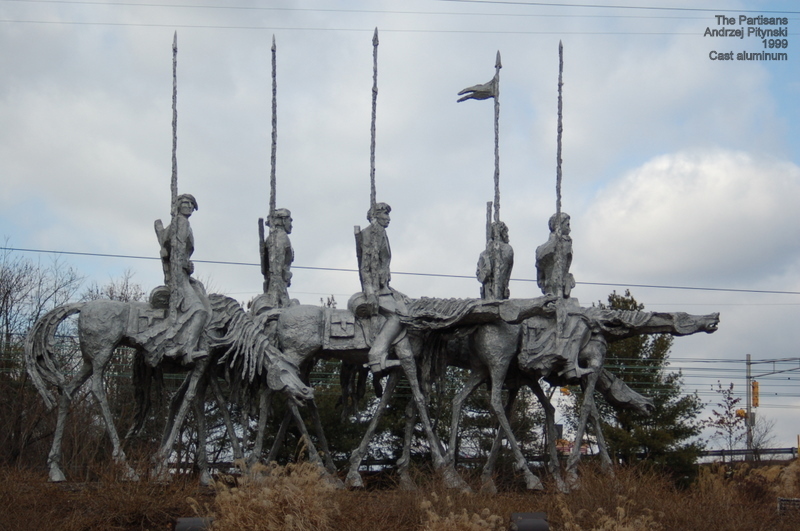 Made out of cast aluminum, it pays homage to the valiant and exhausted soldiers and their horses fighting to the bitter end in the Polish underground. Travelers on the train can see one of the horses looking as though it’s trying to flee. As we approach the curve in the road we come upon a bright yellow piece in front of us. 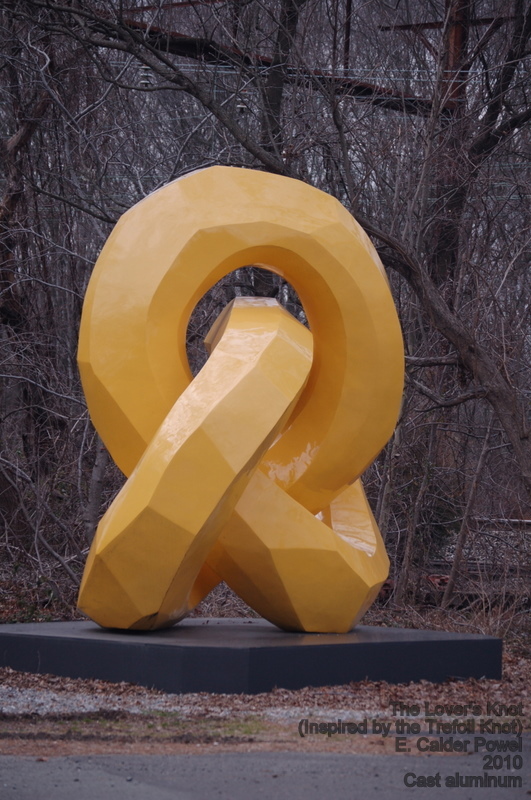 The Lover’s Knot (Inspired by the Trefoil Knot) is a cast aluminum sculpture by Eva Calder Powel. The trefoil knot is a mathematical wonder that has no beginning and no end, and cannot be undone without cutting. The artist was a mathematician. Then we see John Newman’s On a Yellow Box adjacent to Phillip Stone’s Armored. As we approach the traffic light, we are struck by the young girl learning to ride her bike with her dad on the side of the road. 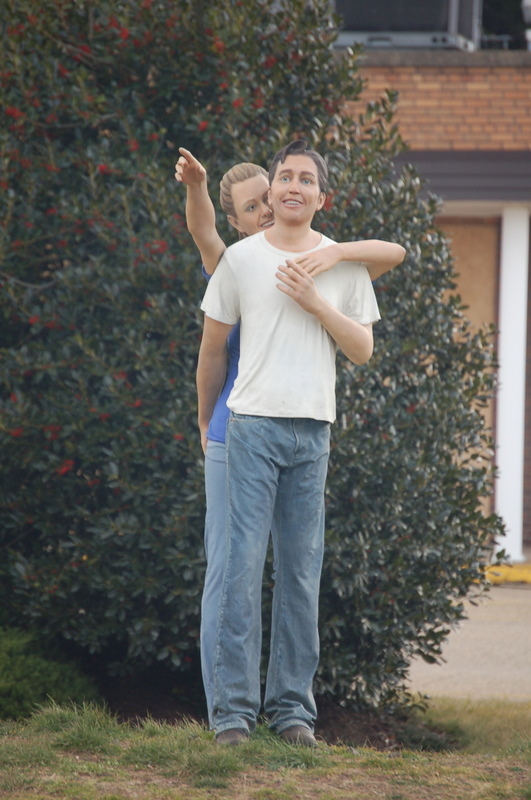 First Ride is part of Seward Johnson’s Man On The Street collection that depicts, with extraordinary realism, common everyday events. Thanks for sitting a spell with me today. Next time we’ll turn the corner and ride along East State Extension chatting about Sculpture On The Way. Jerry Williams is still a volunteer/docent at Grounds For Sculpture. He is still retired from the NJ Courts after over 33 years of service. He still lives in HamiltonTownship, home to GFS, with his wife Brenda, also a volunteer, and their son. He still seems to spend much of his free time at GFS.